Dubai, U.A.E. : SOUQ.com, the Middle East’s largest online retail and marketplace platform announces the launch of its latest category– ‘Global Bookstore’, to provide customers access to over 6 million books on the platform. This huge category expansion for SOUQ.com makes books more accessible to the region and is in line with the UAE’s government vision to prepare a national framework that helps prepare a generation of readers, reinforcing its position as a capital of content, culture and knowledge. SOUQ.com’s ‘Global Bookstore’ features a phenomenal assortment of books covering all classifications including culture, children, family, education, business and many more, to cater to all readers in the UAE and neighbouring countries. According to a recent survey by the Arab Reading Index, people in the UAE read for around 51 hours a year, well above the average of 35 hours for the rest of the Arab world and read 24 books a year compared with the regional average of 16. SOUQ.com’s latest initiative seeks to further promote a culture of reading and seeking knowledge in the region. E-commerce in the Middle East is continuing to show robust growth, supported by the acceleration of m-commerce. According to a recent report by global consultancy AT Kearney, the e-commerce market in the GCC countries is expected to grow phenomenally to $20 billion (Dh73.4 billion) by 2020 from $5.3 billion in 2015. As the regions’ tech savvy shoppers are embracing e-commerce, this growth in consumer adoption is paving the way for more product categories to come online. “SOUQ.com is an empowerment brand and we are constantly expanding our portfolio of products as well as categories to allow our merchants to grow as well as enable our customers to make smarter choices. We are committed to our vision of connecting people with innovative products, incredible deals and ground-breaking technology to provide exceptional service and make the online shopping experience as seamless as possible. The books category is an exciting inclusion and a step further towards completing the purchase cart of a customer on SOUQ.com”, concluded Mouchawar. 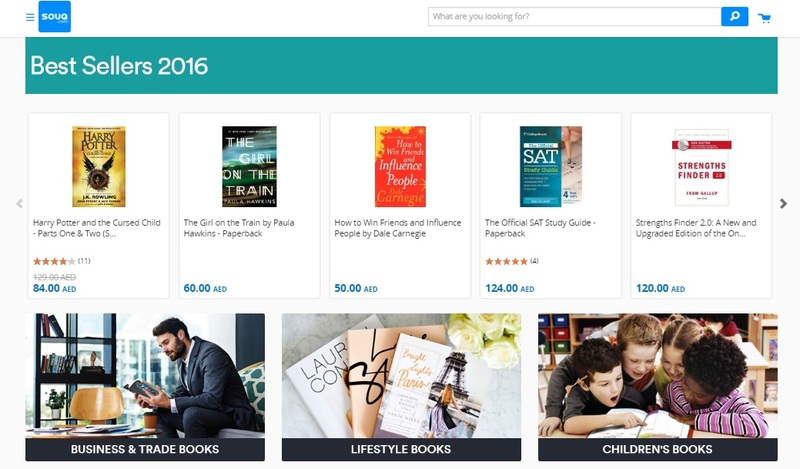 With the introduction of books on SOUQ.com, the customers can now get their hands on their favorite bestsellers and books at the click of a button. SOUQ.com is the largest online retail and marketplace platform in the Arab world, featuring more than 2 million products across 31 categories such as consumer electronics, fashion, health and beauty, household goods, and baby. Today, SOUQ.com attracts over 45 million visits per month, with localized operations in the KSA, UAE and Egypt. Next articleA new era for Nokia smartphones!